At one time, direct mail marketing was one of the reigning darlings of an effective business marketing campaign. However, these days, opting for email marketing to promote your company is a smarter move for many reasons in the global economy. Read further for examples of how email marketing can be more beneficial for your business, as well as quite affordable. Many companies and individuals are looking for ways to conduct a greener, more environmentally conscious business. Direct mail marketing is not a green practice because it involves the use of more paper and environmental resources, such as trees. By using email marketing exclusively — or at least for the majority of your marketing campaigns — your company can become a better partner for a greener world. If your customers are aware and proactive about the environment, turning away from direct mail marketing completely can signal that you are in step with them and that your company is doing its part. In that way, you can increase your company’s reputation while doing a good deed for the environment. Direct mail marketing can be costly in many ways, whereas email marketing costs are minimal. If you are watching your company’s budget and looking for ways to get your message across without spending a ton of cash, dumping direct mail marketing might be one of the first decisions you will want to make. Direct mail marketing costs more because of several factors: First of all, you will need to pay for postage. Next, your marketing materials need to be printed, so that is a cost you’ll need to consider. Finally, unless you have an on-staff design professional, you may need to hire creative talent to illustrate and write your marketing materials. These are some of the main ways direct mail marketing can be a costly proposition. Then consider this: Is your direct mail actually being read, or will it be set aside or thrown away before it’s even looked at? A harsh reality, but it’s true. With email marketing, there is no postage to purchase, no printing costs to bear, and design will be less of a factor, since too much flashy design can often turn off your email recipients. And while it is true that your email could get deleted, it’s a lot more expensive when a direct mail postcard or flyer is tossed into the trash or ignored. With direct mail marketing, it can take a while to figure out how successful your campaign is performing. With email marketing, you can find out much faster and then adjust your campaign based on those results. The beauty of marketing through email is the faster response and the ability to run tests to gauge the effectiveness of your campaign. What’s more, since you are using the world as your marketing reach, rather than just local or regional customers, you can design your email marketing to suit the special needs of each city, state, or country. With direct mail marketing, that option is less attractive due to the cost involved. With email marketing, you can receive a response from Chicago and Tokyo in the same day. There is no cost for potential buyers to reply to your marketing email, and clients don’t have to bother with old-school response mechanisms such as postage paid envelopes — in fact, they don’t even have to pick up the phone (unless they want to). 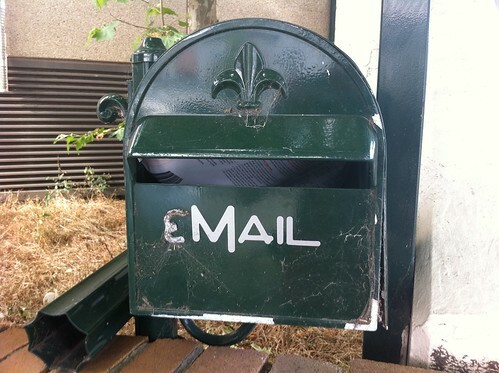 If you decide to switch to email, there are a few protocols you would be wise to follow. First, don’t bury your contacts with too many emails in a day. One is sufficient, while ten is overkill. The key is to keep your current clients interested and informed, not rushing for the unsubscribe button. Another important facet of marketing through email is ensuring that you use an opt-in system for your marketing emails. The last thing you want is for your business to be labeled a spammer, so be sure you cover all the bases when cultivating your email marketing list. By that same token, always make it easy for people to opt out or unsubscribe. If the recipient is removing themselves temporarily but might come back in the future, you don’t want to anger them or run them off permanently by making them jump through unnecessary hoops to get off your list. Doing so will leave a bad impression of your business and may prevent you from reuniting with that contact in the future and, possibly, keep you from making future sales to them. If you’re looking for an affordable way to market your products and services, email marketing is the way to go. While direct mail marketing is still an option, using the far-reaching effect of the internet and its vast online community gives you more options for less cost overall. Bev Sninchak, a veteran freelance writer with 16 years of experience producing content, writes about many subjects and businesspeople, from Steve Wynn, CEO of Wynn Resorts, to managing online business strategies.